Most countries went to war with considerable enthusiasm and patriotic displays. Uninformed opinion believed the war would be short – ‘Over by Christmas’ – but other observers thought it could be lengthy. The Wairarapa was no exception to the national mood. A ‘Wairarapa Fund’ was launched within days, with donations of cash and horses. Public meetings debated how best to help the New Zealand Government, and hence the Empire, in its hour of need. On 6 August the Defence Department announced that volunteers for an expeditionary force should apply at the Defence Office, Masterton. 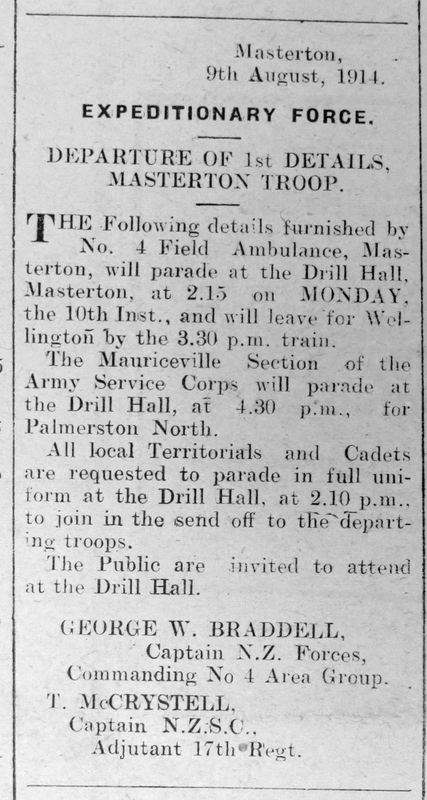 A small group from the 4th Field Ambulance were the first volunteers to leave Masterton, on August 10. Some returned a few days later having failed their medical examination. By 10 August almost 200 men had applied and after medical inspection, over 100 departed by train from Masterton on 13 August, the infantry led by Major Herbert Hart and the mounted riflemen by Captain Norman Cameron. 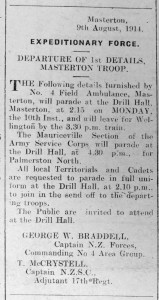 The group, headed by the Masterton Municipal Band, marched from the Drill Hall to the railway station, cheered by well-wishers. On successive days, smaller groups also left for Palmerston North’s Awapuni Racecourse where the Wellington region volunteers began their training. Lady Liverpool, wife of New Zealand’s governor, promoted a national fund to support the war. Sarah Coradine, wife of Masterton’s mayor, headed the local committee of the Lady Liverpool Fund. If there were doubts about the war, no public utterances appeared in the local press.